In the sneek peek email I sent a week ago, I shared this photo of the small scraps I pulled to use to make blocks this month–that’s a very close shot . 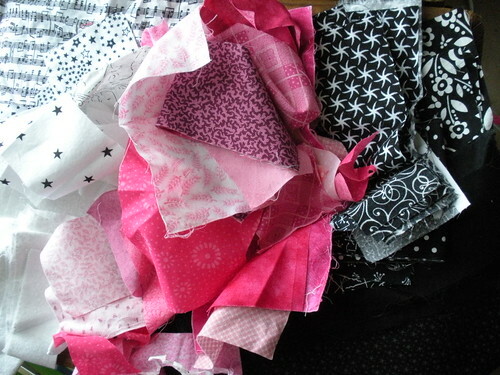 . . those scraps truly weren’t very large.
. . . and here are the fifteen blocks I was able to make from them. And with some smaller pink pieces, I made some scrappy thrifty blocks for a little “feather your own nest” project for myself . . . that I hope to share soon . . . stay tuned.